School Stage is an install specialist providing stage lighting and sound systems for schools, places of worship and community buildings. We specialise in school sound and vision, but also provide audio visual equipment, equipment hire, acoustic curtains, servicing, technicians and training including school stage safety. We understand the needs of our clients and provide quality equipment and service on time and within budget. 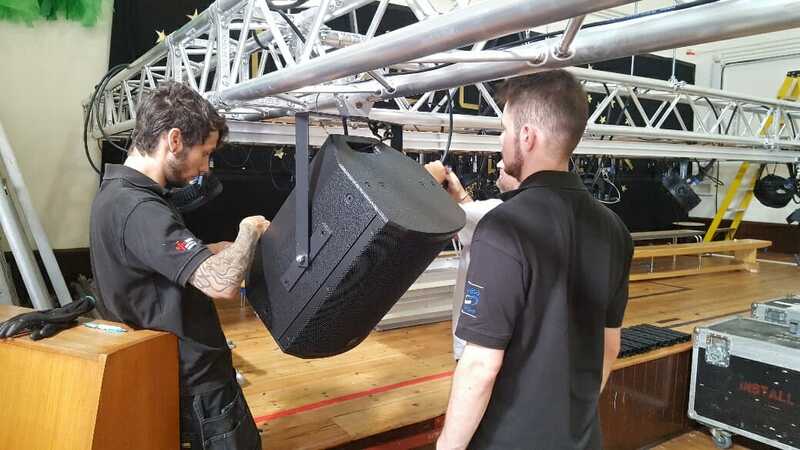 From a couple of spotlights, stage lighting or upgrading existing equipment, right through to installing equipment for an entire concert hall, School Stage offers the same attention to detail with every job. Forward-looking and forward-thinking, we are a small and friendly company who are knowledgeable, helpful and practical. The next time you’re considering an investment in your organisation, call the industry specialists… call School Stage. School Stage is a member of several professional bodies within its trading sector. Compliance with the correct accredited associations ensures that we do our very best to combine quality workmanship with regulated Health & Safety protocol. Accredited Contractor for the Contractor’s Health & Safety Assessment Scheme. We are Full Premier Members of PLASA, an international organisation for those who supply technologies and services to the event, entertainment and installation industries. Part of the Register of Companies tried, tested and trusted by the education sector. We’re members of the ABTT, an organisation who care about a safe and successful theatre industry. We’re accredited by this UK Government Certification Service. ”I wanted to turn our basic hall into a colourful environment where children could put on productions. School Stage helped us achieve this. Whether you’ve an enquiry about upgrading your existing equipment, would like to create a new system from scratch or, you’re thinking about investing in a major installation, our friendly and knowledgeable team can help. Have you watched any of our videos? School Stage™ provides stage lighting, sound and audio visual equipment, installation, hire equipment and technical support for schools, colleges, universities, places of worship and community organisations in London and all over the UK. All images and videos are copyright of School Stage. © 2019 School Stage. All rights Reserved. School Stage™ and its logo are Registered Trade Marks. School Stage™ is a trading name of CW Newton Ltd. All images and videos are copyright of School Stage. Website powered by Halogen Digital.